Civil forfeiture in 1455. 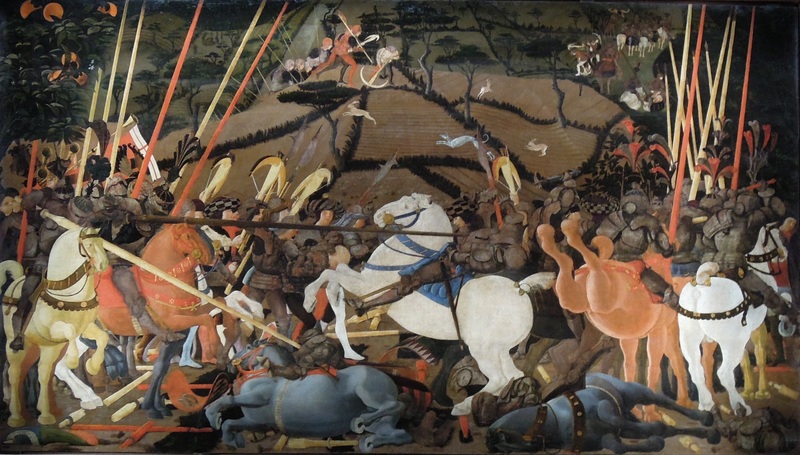 (“Battle of San Romano” by Paolo Uccello). The recently released Justice Department report on the Ferguson municipal government is a damning indictment of the systematic racism practiced by police officers, court officials and city administrators. Though some have deemed the content shocking, the Justice Department has merely added the weight of thoroughness and official sanction to accusations originally substantiated by Radley Balko and the Ferguson protesters last fall. The true shock of the report lies in the numbing onslaught of outrageous stories and irrefutable empirical evidence cataloguing the mistreatment of people for the color of their skin. Henry Farell at The Washington Post took a fascinating angle on Ferguson by comparing the organized plunder of black residents there to the feudal conditions under which early states formed in Europe, relying on the theories of Charles Tilly. Tilly argued that early governments arose from organized protection rackets born of anarchic violence, and that the eventual winners of various turf wars sought to monopolize the use of force in the areas they controlled. This allowed them to extort protection from those under their control – in truth, protection from both the threat of state violence and outside aggressors. Over time, the people under state control demand a less exploitative state, and the state moderates its behavior in return for legitimacy. I think the allusion to Tilly is sound, but misses important historical elements. The first is that state formation is far from an abstract relationship between ruler and subject; focusing on state violence and extortion ignores the moral culpability of other actors who stand to benefit from state plunder. Yes, the municipal officials of Ferguson benefit directly from padding their revenues with an excessive amount of fees and fines. But the many white residents of Ferguson and similar Missouri suburbs benefit as well, from decreased economic competition from their black neighbors. Over 76 percent of Ferguson residents have a current warrant out for their arrest, mostly for minor fines and traffic violations; given that black men and white felons have the same chances for hire, it is safe to say that these outstanding warrants have made it difficult for many black Ferguson residents to find employment or run their own businesses. The second important point to be made is that state legitimacy is often predicated on further state extortion, directed without at external enemies or within at victims under state control. The twin histories of Native American genocide and slavery attest to strains of these legitimization tactics in our own history, as well as the predatory nature of the state. While early European statecraft offers a comfortable distance, we do not need to look very far back to find horrific examples of state extortion within democratic societies. The disheartening truth is that black Americans have often and perpetually been legitimate targets for state extortion, and that the legitimacy of this exploitation has been recognized since our arrival in this country. A heartening truth has been the persistence of efforts to stamp out this exploitation in whatever form it has taken throughout our history. It is a hopeful sign that many are recognizing truths long known by the marginalized and oppressed. I am glad that the Justice Department’s report has expanded the Ferguson debate beyond the confines of the questions surrounding Mike Brown’s death, which reflected our tendency to focus on personal narratives over larger wrongs. That the focus is squarely on the massive failure of our criminal justice system to deliver justice for all is a welcome change.